Christianne Stotijn's new disc for Onyx sees her leave behind the German lieder that she sang, to great acclaim, on her first two discs for the label to tackle a programme of Tchaikovsky. And with her now regular accompanist, Julius Drake, the results are no less persuasive. Richard Sylvester's liner note quotes a description of Tchaikovsky's song output – he wrote more than 100, designating them Romances – as 'the most poignant creations of his genius'. This is very much borne out by the selection here and they are songs which even with the scantest knowledge of Tchaikovsky's biography take on even greater poignancy. The poems speak predominantly of love, but it's a love that seems only to result in pain, fear of rejection and regret: a mood that Tchaikovsky captures consistently with a touching, highly personal blend of melody and melancholy. The programme extends from the early 'My genius, my angel, my friend' (1857) – an astonishingly assured song in terms of both musical language and technique – through most of Tchaikovsky's creative life and for anyone familiar with Stotijn's talent and temperament, it will come as no surprise to find her very much at one with the composer's idiom. From the start of 'At the ball', which opens the disc, Stotijn captures that mixture of wide-eyed vulnerability and suppressed passion that runs through much of the programme. Some might find her way with the favourite songs a touch understated at times – she makes a lot less of 'Why? ', for example, than some – yet she does not turn her back on the raw emotion that often rears its head in the midst of so much melancholy reverie. Stotijn's control is consistently impressive, such as in a beautifully nuanced and haunting rendition of 'Lullaby', with its floated top note on the penultimate line, or the pared down sound she produces for the final melisma in 'My genius'. In the 'Bride's lament', she once again captures the almost objective melancholy but, when required, injects emotion to telling effect, here to Drake's gentle embellishment of the vocal line. Several of the songs are highly suggestive of the operas, perhaps none more so than 'The fearful moment'. Despite its strong musical and poetical hints of Tatyana in Evgeny Onegin, however, Tchaikovsky here provides his own verse in a song that can hardly be listened to without thought of the emotional turmoil that informed much of his biography. Again and again the highly personal nature of these Romances comes to the fore, such as with the almost shockingly emotional outburst in the piano part at the heart of 'Do not believe, my friend'. Even 'Can it be day', one of the few songs on the disc that captures the exhilaration of being in love, ends in a thoughtful postlude (beautifully shaped by Drake), while the optimism that one feels at the start of 'It was early Spring' again dissolves into something less up-beat. Possibly the most enjoyable number on the disc is the delightful 'Cuckoo', one of several songs Tchaikovsky wrote 'for children' but which is both humorous and sophisticated, looking forward to Mahler's 'Lob des hohen Verstands', yet without its satirical undertow. There's nothing elementary about the demands it makes on the performers – both of whom are exemplary – however it leaves one wishing that maybe the decision had been made to leaven the atmosphere with a few more songs in this vein. Although she seems particularly adept at finding the Schumannesque Innigkeit that is prominent here, Stotijn produces heart-felt emotion, never artificially heightened, when called for. 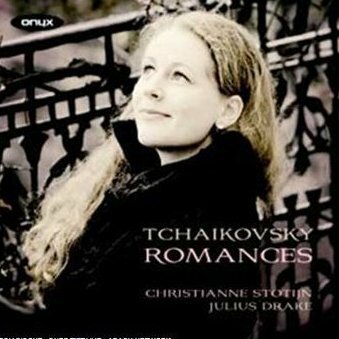 There have no doubt been more powerfully charged – or highly-strung – champions of this relatively unknown part of Tchaikovsky's output (such as Julia Varady on her Orfeo recital) yet Stotijn's approach is convincing and affecting. With typically sensitive support from Drake and natural engineering from Onyx, this disc can be highly recommended.